“Man,” yes, my neighbor’s real name, was a man-child in all respects. He was always serious and rarely smiled, even when we played happily for hours. We were young, feral children running wild without a care in the world–not a care bigger than a streetlight curfew. At a young age, our crew would skateboard, hop barb-wired fences, and have brick fights with cardboard boxes as shields. For money, we would yell out “Po-Po” for local “sidewalk executives,” and be promptly given $5 for each police car we were able to spot before the police ravaged our block. Even as kids, we understood that it should be legal for people to medicate with Cannabis Sativa. Afterwards, we would take our money to buy candy at Mr. Johnson’s “little red house” around the corner, getting chased with Kujo-levels of viciousness by local dogs as we cut through our neighbors’ yards to shortcut to our favorite candy store. On that day, the day before crack hit, someone stole my little red bike while we were inside the ”little red house” buying candy. Man took over from there and all I remember is the maze of homes we both barged into, on a mission to find my bike. I stood amazed at how Man would talk to the adults, like they stole something, even daring them to lie. After a few hours of investigation, and several more tears from me, Man finally delved up enough intel to get a location on my bicycle thieves. 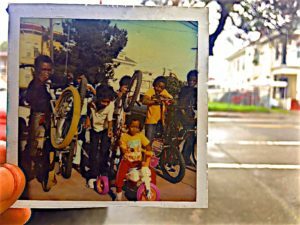 We caught them–hours deep into breaking my bike apart for scraps–in a random West Oakland backyard. These thieves, although a few years older than us, apparently had to respect the lethal risk of dealing with Man’s father, who was a luminous figure in our neighborhood and not worth the trouble of a little stolen red bike. Shockingly, Man and I sat there for the next few hours eating candy while slowly watching them put my little red bike back together. Man would bark at them to “get it right,” then looked at me knowingly, and smiled. I smiled back, finally, without tears. That day, on the day before crack hit, we were young, black kids: happy and free. The stolen red bike was the worst we would experience in our neighborhood. That is, until the day Crack hit. A few decades later, Mandela Parkway looks different. West Oakland has seen a lot: Huey P. Newton expired over a drug dispute and his blood still stains the remarkably under -recognized West Oakland block. Gary Webb of the San Jose Mercury News infamously wrote about the hidden trails of the Iran – Contra affair and how planes packed with cocaine dumped massive amounts of dope in darker neighborhoods just like West Oakland, California. Grandmother Melvin, arrived from Mississippi in the late 1940’s. She owned several homes, owned hair salons, and became a registered nurse in West Oakland where she raised seven kids. Dr. Lige Dailey (Damu’s father) in the suit, the twins, and dog Roxy. 9th and Wood. Street corners exist where “sidewalk executives” parlayed cursed empires on the cocaine connections well- documented by Gary Webb’s reports. 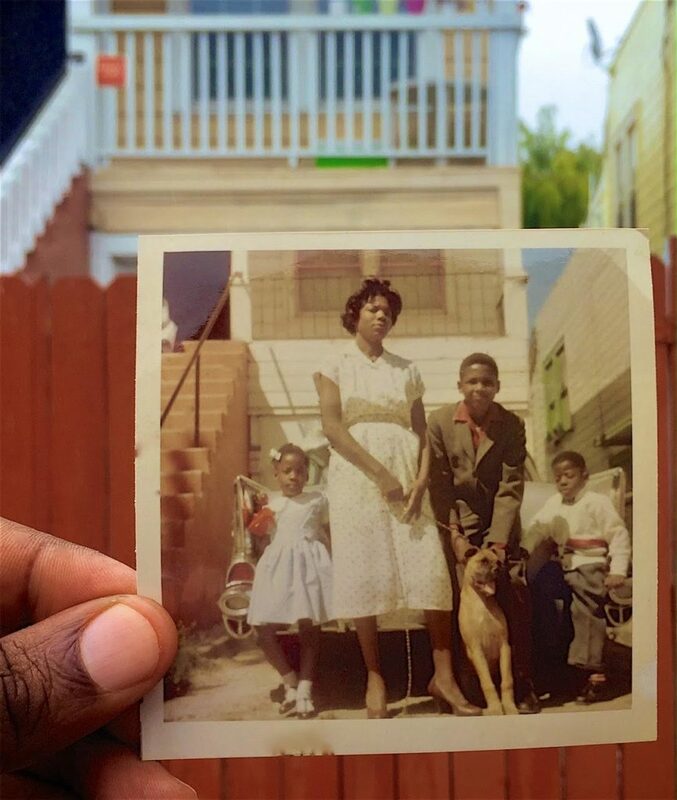 The respectability of our grandmother’s West Oakland neighborhood began to regrettably disappear during this chaotic time. As a result, there’s a culture clash happening now. Around the corner another man was recently murdered at the liquor store on 7th Street by Mandela, and simultaneously a hipster exits the same liquor store carrying a 12-pack of Tecate’, nonchalantly smoking a cigarette and smiling, while walking home in a unused bike lane. The divide between the two worlds is palpable. 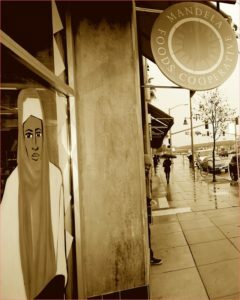 Across the street from the neighborhood liquor store is a weathered 99- cent store, and down the block is Mandela Foods Cooperative, and it’s at this intersection where the hustle of the West Oakland Bart Station and the legendary history of 7th Street meet. 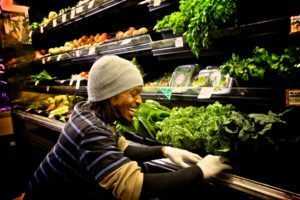 For West Oakland, Mandela Foods Cooperative is a rare sea of wellness in the community.http://www.mandelafoods.com West Oakland is actually considered a food desert by some, where food is often deemed chronically unhealthy or where good and healthy food is considered sparse. Mandela Foods Cooperative was started as a response to this emergency. 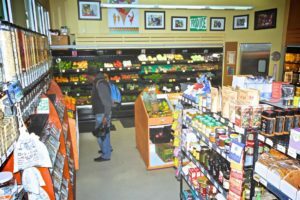 Inside of Mandela Foods, a young, black cashier with dreadlocks smiles and points me towards James (he preferred to give only his first name), someone at the Mandela Foods Collective who explained to me the importance of the collective. 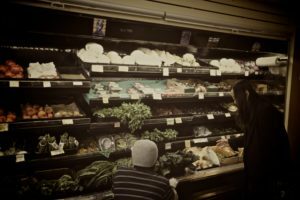 I wondered out loud with James (thinking of my Grandmother Melvin and our family’s deep history in West Oakland) about the changing demographics of West Oakland’s community, and how that affected, if at all, black-owned businesses. 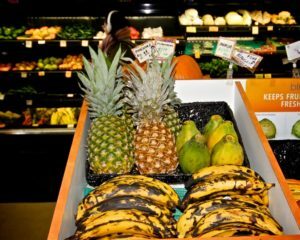 James confirmed that non-blacks shopped at Mandela Foods Collective. “They’re about 70 percent of our everyday business, to be honest. They love us being here,” he said. As we conversed, James and I realized, that we both know my childhood friend, Man. He reported that Man is still living in West Oakland, doing well with a family of his own. We realized coincidentally that both of our families migrated around the same time in the 1940’s to Oakland from the South. Both our families owned homes near 14th and Peralta off of Mandela Parkway in Oakland. We all used to ride through these streets as young boys, breezing through these intersections on our bikes. Before crack hit. Now gentrifiers, hipsters and financial types wait for their Uber at these same intersections. On the other side of the crack epidemic that forced my family to move for safety from our beloved home, there is a revitalized thriving area for some in West Oakland now, but not all. 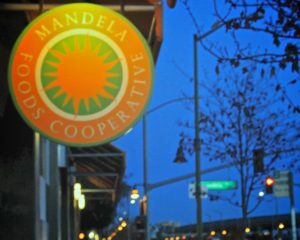 But it’s in Mandela Foods Collective that I see the undefeated, and loyal spirit of West Oakland, the healthy and thriving town where my grandmother’s great migration ended, and where our family’s new life began. Reading this story is like time-traveling. Your old family photos are especially powerful. The image of your childhood friend Man, barking “get it right” at the thieves, as they put your bike back together is so poignant.